What can I tell you about this quilt other than how much I love it? I started collecting Liberty of London scraps back when I started sewing, hoping to someday have enough to make up a quilt. I always imagined making a throw – something to snuggle under while watching tv – though when I started cutting squares, I failed to consider the size I’d need, and without realizing it, ended up with a queen sized quilt top, rather than the more modestly sized throw I had intended (not that I’m complaining, mind you!). The only issue was that we had recently upgrade to a king sized bed. Thanks to some kind blog readers who sent along some extra squares, I was able to add to that quilt and turn it into a king sized top. Though all along, I still was wishing for that throw I always imagined. I realized I might have enough left over for a second quilt, so I cut the remaining Liberty prints into 4.5″ squares and made up this small throw. I love the way Liberty looks in simple patchwork – even though some of the colors and patterns don’t necessarily go on their own, I like the way they come together in these simple squares. 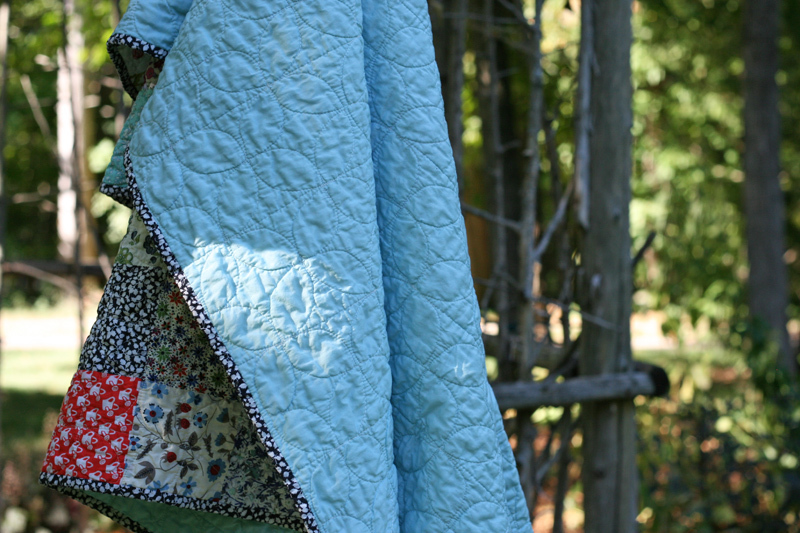 I backed this one with light blue voile, because I wanted this quilt to be as soft as possible, and indeed, it’s so soft and lovely, I may never get off the couch! To keep it soft and drapey, I used Quilter’s Dream Request, which is their lowest loft. It measures somewhere around 50″ x 60″. 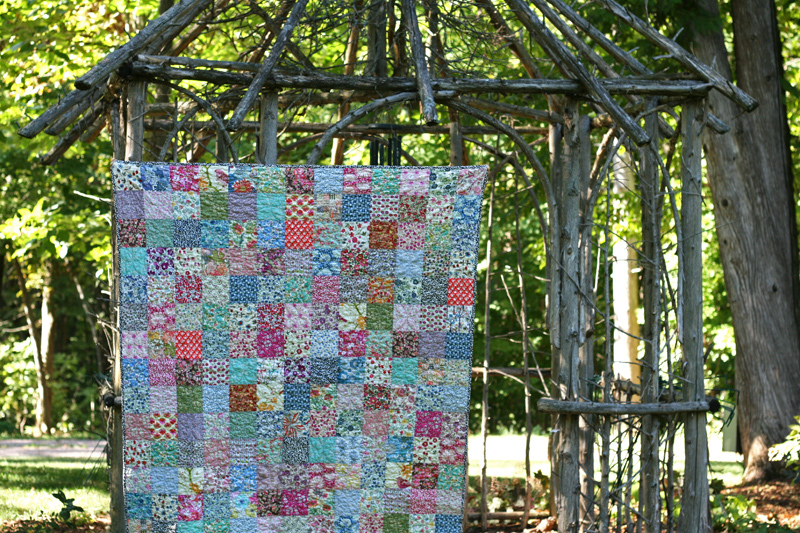 I quilted it with Elizabeth’s Dogwood pattern, which I absolutely adore. It’s fun to quilt, and I love the way it looks, especially on a solid backing. Plus, when you use this pattern with patchwork squares, there’s little to no marking needed (a bonus in my book!). It’s bound in a little more Liberty, and well, I’m in love! If you need me you can find me on the couch under my new quilt! This entry was posted in [search] Charm Quilts, Fabric, Posts about Quilts and tagged dogwood quilting pattern, handmade, liberty of london, patchwork, patchwork squares, quilt, quilting. Bookmark the permalink. 28 Responses to ah, a Liberty throw! So much gorgeousness in one piece… I dream of what I will do with my Liberty charms as I continue to collect them. You make simple so tempting. I remember reading about you collecting those pieces and look at the lovely result. Cross that one off your wish list. You have a gem on your hands, or should I say, your lap? oh, I love it! 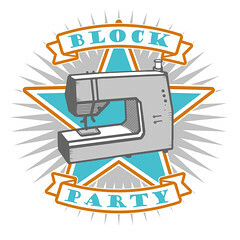 I’ve got a bit of Liberty and this may be just the thing to do with it (keeping it simple and about the fabric). You do such lovely work and I’m always amazed at how much you do with a little one around! 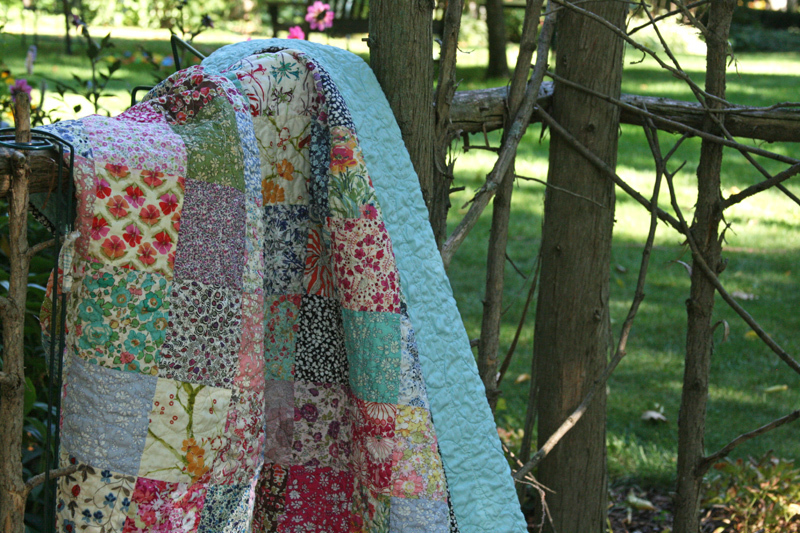 I would love to know some of the technical details for making a quilt with so much slippery fabric! Do you use starch? What needle size do you use for piecing/quilting? Delightful! 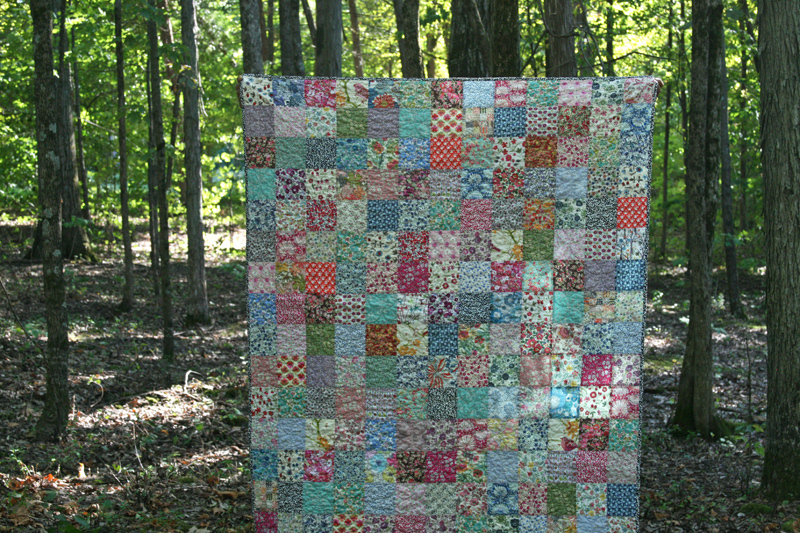 I hope to make a Liberty quilt/throw myself one day; yours is beautiful! I have throw envy, so gorgeous!!!!!!!!!!!! Beautiful!!! I can only imagine just how luxurious it must feel! Mmmmm. I can just imagine how yummy this throw feels! Just amazing! I too love Liberty! Enjoy your new quilt..
That is just lovely. I can remember being taken to Liberty’s as a small child and loving the tables on the ground floor with things made from the fabrics, hankies, tissue holders, make up bags, little floppy frogs filled with rice. I would spend ages touching and looking, to be dragged away by my mother to continue with our shopping. I still get a thrill when I go into the store and the fabric department is awesome. Sweet! 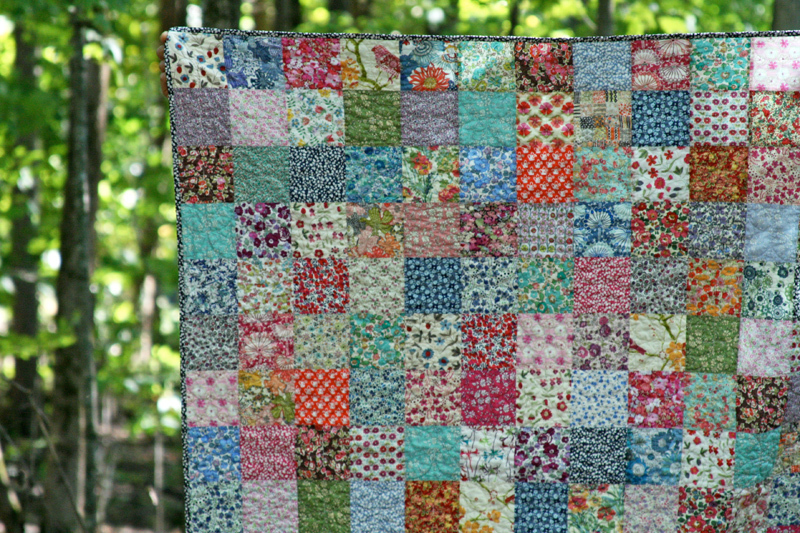 Did you use your regular machine or a long arm for the quilting? I did the quilting at home, using my Pfaff Grand Quilter, which has a bit more harp space than a regular sewing machine. I Looooove it. Lot’s of blogs talk about these liberty prints. I live in Holland and never heard of them. 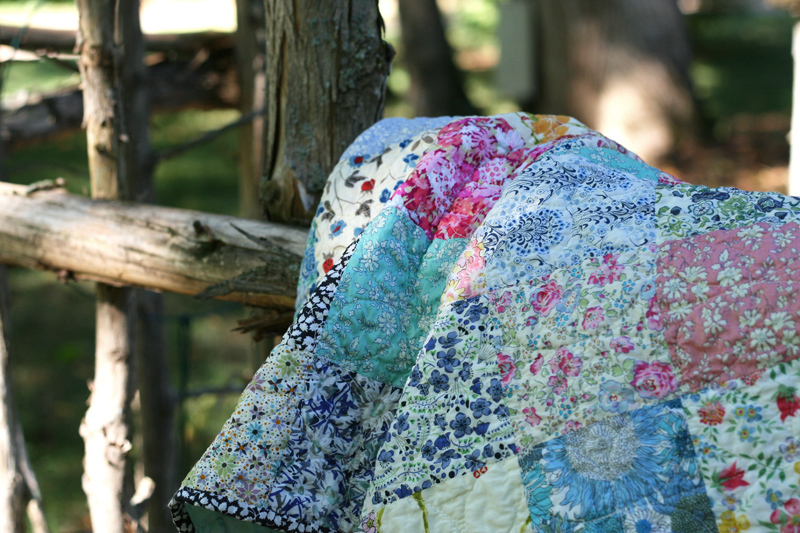 I’m not a flowery girl, but boy, do I love this quilt! It is so gorgeous!! I want to make one sooooo bad! thanks for the tip about Jo’s shop, I had no idea how I was going to collect a bunch of squares. Is liberty of london a sheer, silky fabric? 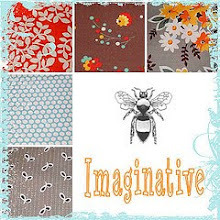 Or is there a cottony fabric line? Thanks for sharing your quilt. Hello. I’m so happy I found your site through Google images. I was looking for pictures of Liberty quilts because I’ve been dreaming of having one myself. Only problem is I don’t own a sewing machine, I have little to no sewing experience and I wouldn’t know where to begin. If only I had a quilting mentor as a family member or friend. After reading up on Liberty quilts I’ve seen that the fabric can be difficult to work with. Can a beginner make a liberty quilt? I would probably mimic yours as it’s gorgeous. Do you have a pattern for yours, or dimensions? Did you collect Liberty fabric squares (charm squares?). Or, did you cut your own squares out of Liberty fabric?